Update 3.0 - Patch notes discussion! I've updated and had him unlocked already and he still has lucky. Yes, I have a snowy camp and a lucky Rick. Seems it's only affecting those who hadn't unlocked him. I hope NG wasn't trying to pull a fast one?! So there's a pattern here: all the screenshots that have Iron Skin are from the Hero Preview screen. The ones who have lucky already unlocked Survivalist Rick. 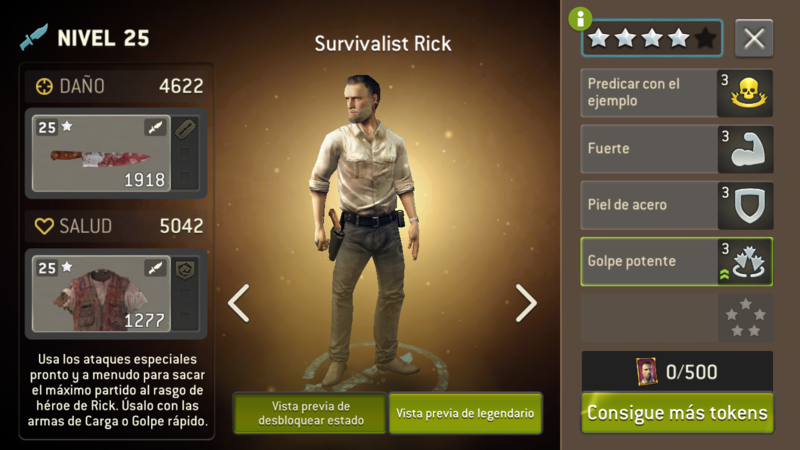 Once you unlock Survivalist Rick, those traits are saved to your game, and that's why it hasn't changed after those players updated their game. 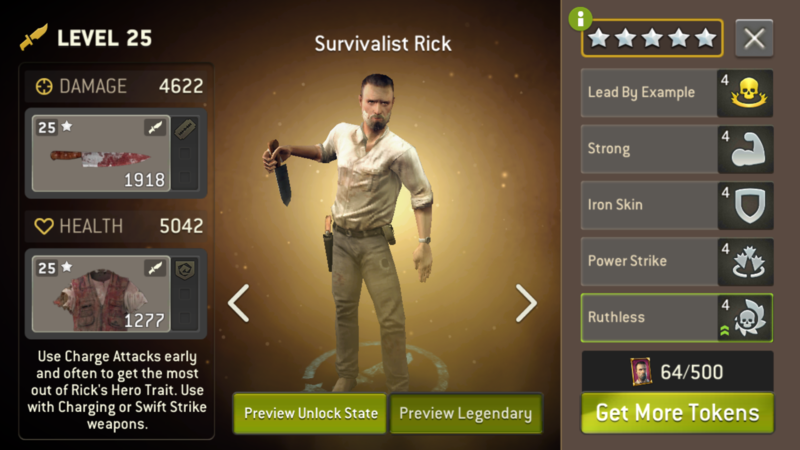 The first version of Survivalist Rick had Iron Skin, but our beta testers suggested to change it to Lucky instead. But it seems it wasn't changed in 3.0, only in 2.12. Short version: should be an easy fix and we'll probably fix it tomorrow. Thanks again for letting us know. You saved millions of Survivalist Rick lives! New Tactical not to sure about this. > New Tactical not to sure about this. I think on a scout weapon in the distance this could be very useful. Silver tactical and gold charging and razor, attack a high health walker and move to a safe distance. @Kaz One here with same rick Problem. So with the new tactical trait, what do you guys think about a scout weapon with silver tactical, gold interrupt, and gold razor? Leave a scout in overwatch, allow the armored/fatty to come to you, interrupt his movement, then attack and run away. Does this sound like a plausible strategy? Sounds pretty good especially with Power Strike. But what will happen with your DD scout if Razor isn't triggered against +10 armored/fattie that you are waiting for? Anyway, it's a good trait for spawns when you finish your turn nearby a spawn point. Hi @kaz May I know much is the % of the tactical trait activicting? Does it also stack with swift strike? @Steeboon I know Kaz is often busy so on reading the trait description it seems pretty obvious that it's a 100% chance. It won't stack with swift strike as they're two different traits and work differently, one works 100% of the time from an attack if you haven't moved whether you kill the walker or not, the other works 40% of the time after you get a kill even if you have moved. > @Steeboon I know Kaz is often busy so on reading the trait description it seems pretty obvious that it's a 100% chance. It won't stack with swift strike as they're two different traits and work differently, one works 100% of the time from an attack if you haven't moved whether you kill the walker or not, the other works 40% of the time after you get a kill even if you have moved. Thanks @WellyLuga but the trait says “they may also move after attacking” instead of “they will move after attacking” hence my question. @Steeboon . Moving is never obligated, you can still choose to end turn. 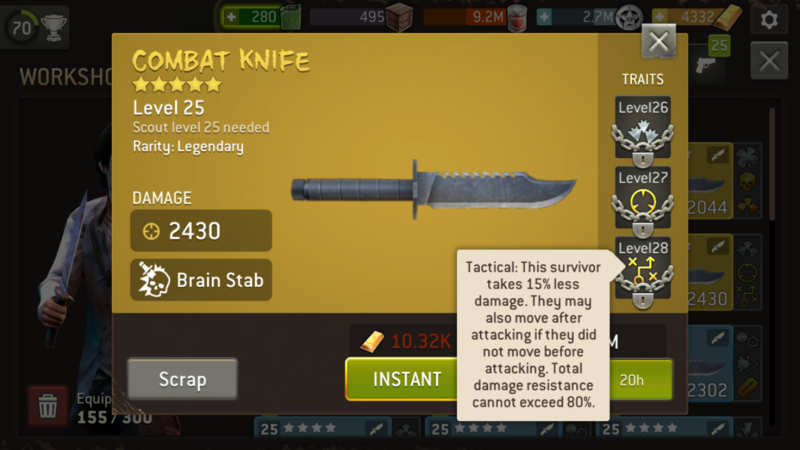 In short, it is a combination of 100% swift strike (minus the killing factor) so Long the survivor doesn’t move before attacking plus a guaranteed 15% less damage (gold trait). If the above is accurate, I stand a chance of 3 turns if coupled with swift strike? In the description it says move after attacking. 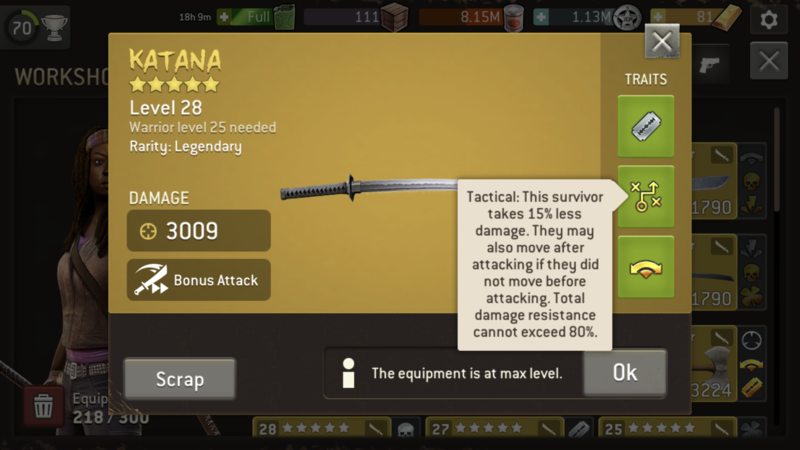 Does that mean that when the trait is activated you can attack and move away but you can't attack another walker? > So with the new tactical trait, what do you guys think about a scout weapon with silver tactical, gold interrupt, and gold razor? Leave a scout in overwatch, allow the armored/fatty to come to you, interrupt his movement, then attack and run away. Does this sound like a plausible strategy? Probably won’t need gold interrupt since interrupt won’t work if razor don’t activate. So if you attack before moving, then you can still move around but you can't attack another enemy. If Swift Strike gets triggered then you just have the normal Strike movement and extra attack. 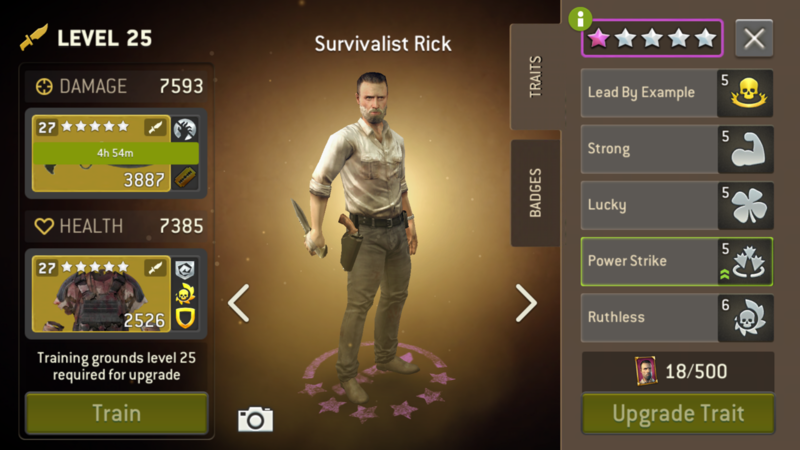 Regarding Rick's trait, it's now fixed so Lucky is back! Thanks for letting us know! @Kaz Thank you for clarifying that. I guess it's for the better. It would create a huge advantage if combined with other traits and charge abilities. Are there any plans of removing old traits or combining them? 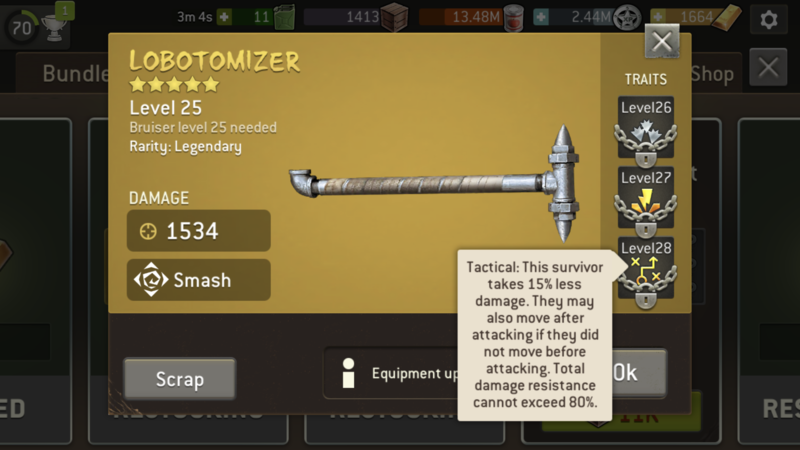 With the current traits for example, there is much more room, even need, for different combination of scout weapons. On the other hand, there are very few viable combinations of assault weapons. It would cater to both the lower level players who dont have the resources to upgrade all those weapons to explore the scout class and to the high end players who are trying after each council update to find new weapons with the set of traits they want. We are publishing it now, so in a couple of minutes, right before the challenge starts! Currently, we have no plans to remove traits, but our idea is to, of course, add traits that are good, so maybe it'll be harder to find a unicorn weapon, but, there'll be plenty of other good combinations. Wondering if you can tell us how much GW gas will be available in The Distance?